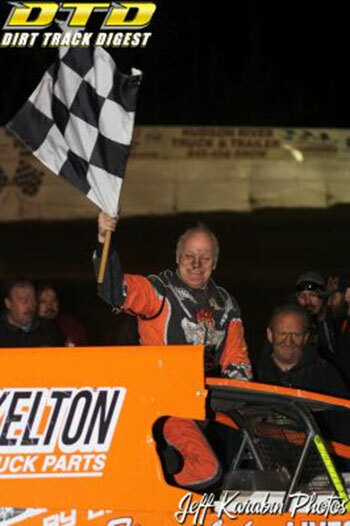 ACCORD, NY - On an historic day for New York state dirt-track racing, Danny Johnson brought down the curtain on the 2015 outdoor season at Accord Speedway. For the first time in 27 years, a Northeast dirt-track event was held in December as the Ulster County facility hosted the rain-postponed 'Gobbler' special. Johnson, of Rochester, N.Y., guided Chris Gennarelli's No. 27J to victory in a down-to-the-wire 50-lap big-block/small-block Modified feature before a packed grandstand on an unseasonably warm Saturday. Johnson earned $5,695 for his efforts at the co-promotion involving speedway promoters Gary and Donna Palmer and Brett Deyo of BD Motorsports Media LLC. "I always look forward to racing here at Accord," said a smiling Johnson afterward. "If it was closer, I'd be here more often. Thanks to the promoters for giving us a chance to race for this kind of money so late in the year. It feels good going into the winter. "I can never remember racing this late in New York." Johnson was a heat-race winner earlier in the afternoon and started from second in the main via a redraw of top qualifiers. At the start, he outgunned first-time Accord participant Tyler Siri to assume the lead. The first 11 laps of the main spun off caution-free with Johnson approaching lapped traffic as the yellow lights flickered on. On the ensuing restart, Siri ? a regular on the New York circuit at Black Rock and Five Mile Point speedways ? swept past Johnson to put his No. 5* into the top spot. Following the race's second caution on the 20th lap, a heated green-flag stretch of 23 laps ensued with Siri leading Johnson and an impressive Billy Van Inwegen, at the controls of Dieter Schmidt's familiar yellow Lincoln Auto Body No. 5. With the leaders catching the back of the field and time winding down, the lead trio at times spread out three wide with Siri running the outside, Johnson the middle and Van Inwegen the extreme inside. On lap 43, the race's complexion changed dramatically. A scramble on the backstretch resulted in Siri spinning at the entrance of turn three. Johnson then reclaimed the lead over Van Inwegen. A tangle on the restart drew an immediate yellow. When starter Jeff Merkel unfurled the green, Van Inwegen edged ahead of Johnson entering turn one. Johnson, however, surged back ahead in turn two. Johnson fended off Van Inwegen over the final seven laps to take the checkered and draw a buzz from the large crowd. Van Inwegen, of Sparrowbush, N.Y., finished an impressive second, turning around his streak of late-season bad luck since joining forces with iconic north Jersey owner Schmidt. In his final ride for car owner Dave Zubikowski, Jeff Strunk of Boyertown, Pa., earned a podium finish. Strunk methodically worked the inside lane from his eighth starting position to finish third. Andy Bachetti of Sheffield, Mass., secured fourth position on the final lap with an outside pass of Tyler Dippel. Bachetti had started sixth, dropped back early and rallied in the final laps. Wallkill, N.Y., teen Dippel completed the front five. Finishing sixth through 10th, respectively, were Jerry Higbie Jr. of Newburgh, N.Y.; a steady Mike Ricci of Tillson, N.Y., who started ninth; 14th-starter Danny Tyler of Cottekill, N.Y.; original 'Gobbler' winner Anthony Perrego of Montgomery, N.Y.; and 24th-starter Chris Shultz of Pawling, N.Y., who earned the $300 Hard Charger Award sponsored by Economy Movers. Heat winners, receiving $50 each from Craig Decker Forest Products, were Van Inwegen, Johnson, Bachetti and Perrego. Dan Humes (Canaan, Conn.) and Chuck McKee (Middletown, N.Y.) split the consolations. Capital District star Tim Hartman Jr. of Niskayuna, N.Y., invaded and drove to victory in the 25-lap Open vs. Crate 602 Sportsman main. Hartman earned $1,650 for his efforts: $1,500 from the posted purse and $150 from United Pump & Tank as the first Crate 602 engine across the line. Hartman felt heavy pressure negotiating traffic in the final laps from Tyler Johnston, who finished a half car-length back in second. Third-generation driver Allison Ricci drove a consistent race to finish third, with 12-year-old rookie Leo Fotopoulos fourth and Randy Green, another third-generation driver, completing the front five. A 10th-place starting position couldn't keep Ray Tarantino of Poughkeepsie, N.Y., from earning a $1,000 payday in the Ron Wright Memorial 20-lap Street Stock/Pure Stock headliner. Tarantino, whose car was damaged in a heat-race incident, emerged unscathed in Victory Lane following a rough-and-tumble feature. Kyle Welsh, Jim Maher, Chris Kanuk and Bruce Gordon completed the front five. Young Matt Shultz of Pawling, N.Y., son of Modified driver Chris Shultz, won the 20-lap Slingshot main event worth $425. Shultz, running the outside lane, maintained his momentum ? and the lead ? to best Alan Kober at the checkered. Kober was the runner-up, followed by Alan Selemba, Hunter Lapp and Dale Kober. Chris Kurtz had crossed the checkered first but was disqualified for losing a muffler during the event per Speedway Entertainment rules. Saturday's event closed out the 2015 season for BD Motorsports Media LLC. The '16 Short Track Super Series Fueled By VP South Region opener takes place Saturday, March 12 at Georgetown Speedway in Georgetown, Del. Orange County Fair Speedway in Middletown, N.Y., opens the North Region on Saturday, April 2. For updated information, visit the BD Motorsports Media LLC website at www.bdmotorsportsmedia.com, follow @ShortTrackSS on Twitter or visit the Short Track Super Series page on Facebook. Contact Brett Deyo by phone by 845.728.2781 during business hours. Accord Speedway, a neat-and-tidy quarter-mile clay oval nestled in the hills of Ulster County, is located at 299 Whitfield Road Accord, NY 12404. The speedway is on the web at www.accordspeedway.com. Modified Feature Finish (50 Laps): DANNY JOHNSON ($5,695), Billy Van Inwegen, Jeff Strunk, Andy Bachetti, Tyler Dippel, Jerry Higbie Jr., Mike Ricci, Danny Tyler, Anthony Perrego, Chris Shultz, Jeff Heotzler, Jimmy Wells, Robbie Green, Bob McGannon, Dan Humes, Kurt Hundeland, Dom Roselli, Chuck McKee, Tyler Siri, Rich Eurich, Danny Creeden, Corey Lowitt, Jeremy Markle, Scott Ferrier, Dave Hinsch. Did Not Qualify: John Ferrier, Mike Mahaney, Brian Malcolm, Ryan Darcy, Bob Hentschel, Mark Pullen, Chris Ostrowsky, Brad Rothaupt, L.J. Lombardo, Eric Engstrom. Open vs. Crate 602 Sportsman Feature Finish (25 Laps): TIM HARTMAN JR. ($1,650), Tyler Johnston, Allison Ricci, Leo Fotopoulos, Randy Green, Brian Krummel, Tyler Boniface, Dan Morgiewicz, Bobby Knipe, Kenny Hinsch, Greg McCloskey, Mike Traver, Collin DuBois, Rich Ricci III, Jeremy Pitts, Phil Goetschius Jr., Ken Ferrier, Adam McAuliffe, John Aumick, Stacey Jackson, Chris Stevens, Charlie Hendrickson Jr., Brandon Grosso, Danny Cross. Did Not Qualify: Rob Lanfear, Jeramy Doerr, John Miller, Chris Murray, Adam Gage, Milton Mann, Dillon Steuer. Street Stock Feature Finish (20 Laps): RAY TARANTINO ($1,000), Kyle Welsh, Jim Maher, Chris Kanuk, Bruce Gordon, Joe Narok, Steve Williams, Ryan Brockner, Matt Larrivee, Bob Sleight, Josh Towner, Travis Brockner, Joel Murns, Buck Mills, Walt Henry, Chuck Culbertson, Mike Stebbins, Gary Ronk, Mike DuBois Jr., Curtis Ayers, Tim Southard. Slingshot Feature Finish (20 Laps): MATT SHULTZ ($425), Alan Kober, Alan Selemba, Hunter Lapp, Dale Kober, Cole Stangle, Josh Marcus, Billy Van Inwegen Sr., Corey Cormier, Justin Mills, Hunter Smith, Jared Miller, Josh Kendall, Joseph Smith, B.K. Rizzo, Ryan Neiger, Samantha Miller, Ryan McCarthy, Dylan Steuer, Cole Hentschel, Don Boonstra, Erin Paulison.